I’m going to be perfectly honest and say I was worried about this book. I wasn’t the biggest fan of Sarah Dessen‘s last novel (The Moon and More) and was afraid that I’d somehow just grown out of them. Saint Anything though? It’s by far my new favorite of all her novels. She veered a bit away from the typical ‘girl is struggling, girl meets boy, boy makes everything better’ plot line a little bit and brought some deeper, darker feelings into the mix and it WORKED. I know this is going to sound crazy, but I’m really proud of Dessen. I think she was sort of in a rut and she had this story in her head but was afraid it wouldn’t be a big hit because it addresses issues that she’s never addressed before – but she convinced herself to go for it and I honestly think that it was the best thing she could have done. Instead of just relating to the main character, Sydney, I found myself relating to Layla a lot as well which is unusual for this sort of novel. I think that finally, instead a guy saving the main character in a Dessen novel, a best friend is coming into the picture and helping more than any dude could and I LOVE that. Best friends are around a heck of a lot longer than any guy is, and if anyone saves each other it should be friends. While this story did have it’s downfalls (there’s still that recycled romance thrown in), most of it was really good. There was a lot about Peyton and what he did and how Sydney felt, and more than anything I was driven to my breaking point by their ridiculous mother. She was deep, deeeeep into denial and it was very frustrating. Sometimes Sydney got on my nerves because she would just go along with whatever everyone else said or did, but ultimately I really loved the story. I hope that Dessen continues to write like this but if you follow her on Twitter, you know she’s not actually writing at the moment. Fingers crossed that something inspires her soon! 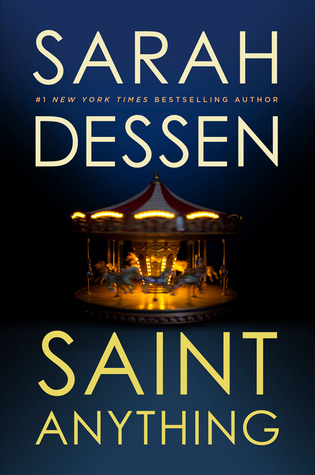 I gave Saint Anything 5/5 stars on Goodreads, and definitely recommend it! Before I jump into my super-short review, let me say: this was a sampler, not the full version. Just saying. I’m basing this “review” off of the few chapters I read. Thanks, NetGalley, for the free sample! Growing up, Sarah Dessen was my jam. It has been years since I’ve picked up a Dessen novel, and to be honest, I was a little bit nervous. Why? Because sometimes nostalgic things are better left as memories (I’m looking at you, Brave Little Toaster). I had no reason to be nervous—in fact, the only thing that bummed me out about this sampler was the fact that it was just that: a sample. Sydney’s brother, Peyton, is the standout child of the family. Popular, attractive, charismatic…he’s got it all. Until he was busted for smoking dope, and later, other various criminal deeds. One night after drinking with buddies, he hits a boy on a bicycle with his car, which ultimately ends in a DUI and a jail sentence. Sydney is “average” but “cute”. I wish this hadn’t been pointed out, but it’s stereotypical younger sibling comparing themselves to the illustrious older sibling, but I ignored it. She blends in. After Peyton’s conviction, she decides to transfer from her expensive private school to the beaten down public school. After her first day, she walks into the pizza parlor across the street (and a bunch of stuff happens over a discussion of root beer YumYums, which is copyright code for DumDums, I believe). That is where the synopsis stops and I got hooked, so that was a bummer. Overall, it looks like it will be another great Dessen read. Saint Anything will be released on May 5th, 2015. I chose this book on a whim after reading several other third installments in trilogies I’ve been reading. Without checking the publish date, I tore into the book, turning pages like it would disappear if I set it down. Needless to say, it was a fabulous read. It flew by in a blur of magic, trolls (which are a magical creature I haven’t seen in the pages of a book outside of Harry Potter or LOTR), and loooove. When I read the summary, I was a little bit weirded out by the concept of a troll-human love story. Again, remember those HP/LOTR trolls? I was not down with that. But Jensen’s trolls are hotties (minus the inbred mutant ones). These trolls are also super smart and don’t follow girls into bathrooms with clubs. I was also a little nervous to read yet another kidnapped-girl-falls-in-love-with-captor type of story. They’re very overdone, and the whole Stockholm Syndrome thing gets a little weird. This was very, very different. Cecile, our protagonist, is kidnapped and taken to the underground troll kingdom in hopes that she will help fulfill the prophecy by marrying the troll prince. It’s dark. It’s dangerous. It’s complex. The world is cleverly built, and the characters are complex. I’m not sure what the time period is—at first, I thought it was set in France because of the names of the mortals in the beginning, but nothing was ever outright said. I know some people have an issue with not knowing where the story is taking place (fictitious world or based on our world) or the time period (medieval ages, etc), but that didn’t bother me in the slightest. 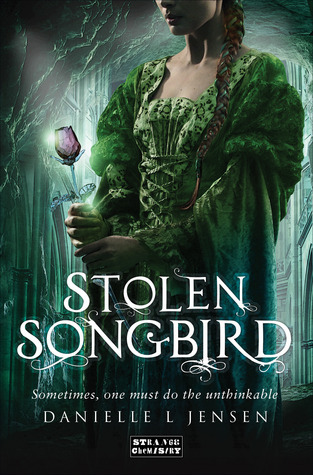 I absolutely loved this book, and was devastated when I went to find the second…it won’t publish until Spring 2015. I am very excited for the next installment—5/5 on Goodreads!